From Goodreads: In the ten years since magic has reemerged in the world, witches have become feared and hunted. 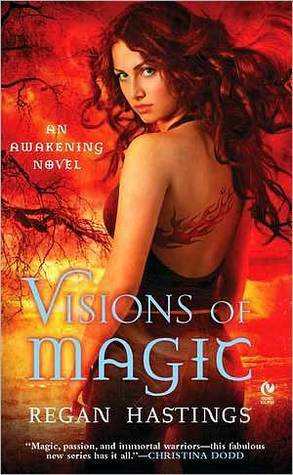 For weeks Shea Jameson has been haunted by visions of fire. When she unintentionally performs a spell in public, she becomes one of the hunted. Her only hope is Torin, a dangerously sensual man who claims to be her eternal mate. What I Loved: This is such a richly woven story that spans time, generations, and even worlds. Regan has set up a series that can only expand and become more encompassing over time. I am not usually a fan of the first novels in a series but this one gives you enough information without having the story lag in order to accomplish it. You are quickly drawn in to the plights of the Witches, their Eternals, and the innocents caught up in the madness. You are given glimpses into the future of the series, some teasers, and some things that you can guess are going to happen. Personally, I can’t wait till my friends read this book so we can discuss 2 things that may or may not happen down the line. Shea and Torin had an amazing love story that made me cry happy tears. What I Liked: The amount of detail in this book was amazing. The descriptions of the magic, of the camps, of the series of networks setup for witches, and the view you get into the other side are really well done. They enhance the story so much that at times you can imagine living in that alternate universe because it is not all that different from ours. This book also makes you think about prejudices and what exactly would you do if you were a citizen in this world. Complaints: The next one won’t be out for awhile! Why I gave it a 5: I really did not expect to like the book as much as I did. I picked it up and couldn’t put it down. It was engaging, thought provoking, and at the heart such a wonderful love story that it was hard not to fall in love with it. I laughed, cried, and even wanted to throw the book a few times when Shea was being stubborn. Anytime I have extreme reactions that means the book did what it was supposed to do! Who I would recommend it too: PNR readers and UF readers that don’t mind that there is an actual HEA. This book has all the elements of a perfect launch to a new series. Think JR Ward and Lara Adrian if they women were the magicked and the men were the mates. Adding it to the TBR pile now! Woot! Five Wine Glasses! After reading your review, I'm looking forward to this book even more. I haven't heard of this book or author before…but a 5 rating? Might have to check it out. Glad you enjoyed it! thanks for the review! !i've never heard of this book before, but if you gave it five stars, i'll have to give it a shot! i'm going to add it to my wishlist right now.